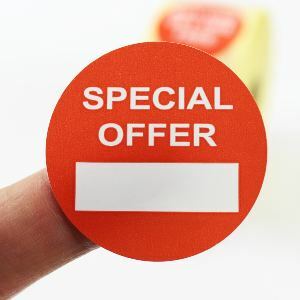 Quick and easy to apply Special Offer promo labels for most retail environments. Maximise your on shelf promotions by highlighting any special offers / discounts with these Special Offer promotional labels. These labels come with an empty blank white box which gives you the opportunity to add your own price using a Biro or Marker pen. Or if you require a more professional looking finish, use these labels in a Thermal Transfer printer to add your own price. The labels are printed red on white semi gloss paper.